I've been wanting to participate in Shady Gardener's Summer 2008 Inspiration meme for some time, and what better time than an overcast, cold, snowy winter morning on the last day of January? I don't know about you, but I sure need some inspiration this time of year! Shady posts monthly themes to address, and as timing has never been my strong suit, I'm going to address both the November topic (think of it as a retrospective!) and the January topic (just in time!). I have a nice cup of tea* at hand, so let's get started! November's query was "Have you planted anything during the 2008 growing season that you can credit to another gardener (blogger or otherwise)?" Yes! Rattlesnake master, Eryngium yuccifolium. I only have this photo of its seed heads in winter, but you can imagine blooms similar to see holly (but smaller and white-green, not blue-purple) and foliage similar to yucca. It's a tall-grass prairie plant, native to Michigan and the Midwest, a few Mid-Atlantic states, and states south of those regions from Texas to Florida. I first saw it in my Ann Arbor friend Aunita's garden, which is a glorious combination of Michigan native and non-native plants, in wonderful combinations of color, texture, size, and shape. Her garden, and she herself, has always inspired me. Last fall, I talked her out of a division (actually a plant that had seeded itself somewhere she didn't want to keep it), which I got it in the ground before it froze. 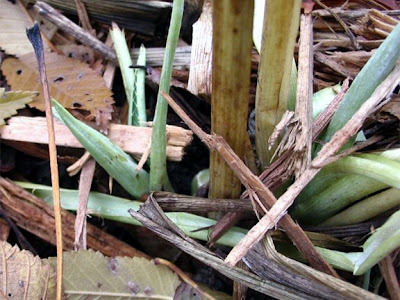 See, it even sent up some new basal foliage before the snow came (photo from November 8). Innit cute?! 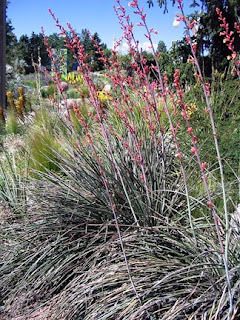 Another new plant in my 2008 garden was red yucca, Hesperaloe parvifolia, which I discovered at the Denver Botanic Garden during a visit to my niece in Colorado in June. I love yucca (even though botanically, it's not) and had never seen any with red flowers, only white. Even though it's one zone out of my range, I ordered two from High Country Gardens upon my return and planted them in July. Because I'm cheap, I rarely buy plants full stop, let alone by mail order, preferring to get them as free divisions or to start from seeds. So you'll know how taken I was by this plant! Of course, this ended up being mostly unnecessary as they've been insulated by snow instead, but who knew? You can see the tips of two of the leaves sticking out in the photo to the left. The plants are over two feet tall, so you have a feel for the snow we've had! I know the plants won't bloom this year, and maybe not even next year. It took a division of mature yucca three years to bloom in my garden, so I'm patient. Yep, patient. I'm just hoping they'll have survived the winter, but I'm feeling positive! 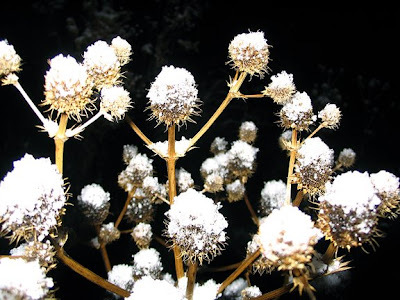 It's not necessarily the cold that kills plants but the change in temperatures and the heaving of the ground. Insulation helps this, and my babies are tucked in snugly with both leaves and snow! Shady's January question is "What does your "2009 Wish List" look like? 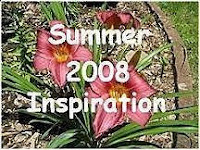 Is there anything there you plan to purchase and/or grow because of your 2008 Summer Inspiration (or even last Winter)?" Yes! 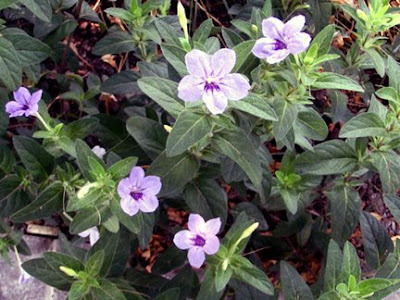 Let's start with wild petunia, Ruellia humilis. I had never heard of this plant until I saw it in the Lurie Garden in Millennium Park in Chicago in July. I was quite taken by its form (noogie noog!). Then Mr. McGregor's Daughter (MMD) mentioned it, saying "Not only does this native plant pump out the lavender trumpets, it does so on the edge of the blacktop driveway, with no supplemental water and no mulch." Well, hello! I was sold. But after extensive Googling, I couldn't find any seed or plant sources, anywhere in the U.S. I even asked the friendly native plant experts at Ann Arbor Parks' Natural Area Preservation. They had no record of it being in our local natural areas and they couldn't find a plant source for it, not even after checking with the USDA. It turns out, in fact, that it's a threatened species in Michigan!! I left words of woe along these lines in a comment for MMD, and she ever so graciously sent me seeds from her own plant! I'm so excited and grateful, and plan to winter sow those precious babies just as soon as it warms up to, say, 32 so I can work outside briefly without gloves! There are many other things I plan to sow this year, that I haven't grown before, including a dozen varieties of heirloom tomato seeds. They were given to me by Royer Held, a local heirloom tomato guru, in exchange for a copy of my book Fun with Winter Seed Sowing. 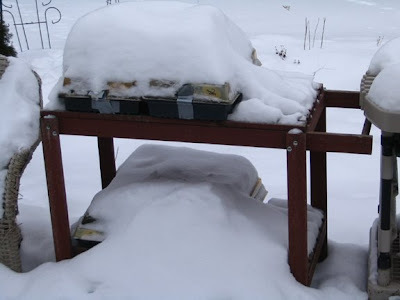 He has always started his seedlings indoors and was eager to give winter sowing a try. I have often grown tomatoes (in fact, you could say a solitary tomato, planted in a container on my deck in 1990, was the "gateway plant" that turned me into a gardener, but that's a story for another day), and was eager to give heirlooms a try. In addition to the heirloom tomatoes, I will also be growing chard, leeks, and potatoes for the first time this year. Chocolate flower (Berlandiera lyrata) remains on my wish list (though it has been winter sown) since a freak cold period killed all my seedlings last spring. And, finally, since Shady asked, here's what my four winter-sown flats look like today. They are eagerly awaiting more "brethren!" Well, actually she asked after my "seedlings," but they won't be sprouting, as you can see, for a few months yet! * Should my English friends be giggling at the thought of Americans and tea (and fair enough; we did throw a bunch of it into Boston Harbor in 1771 and that water wasn't even tepid! ), fear not! My English ex mother-in-law and ex step-mother-in-law enlightened me on the finer points of a nice cup of tea (including the importance of boiling water and adding milk, though they disagreed on whether to put in the milk before or after pouring the water). I even have an electric kettle and indulge in imported tea bags, which are a stronger blend than is sold here, even under the same brand name. Right now it's PG Tips (least costly and easiest to find), though I also like Typhoo and especially Brooke Bond D (hard to find!). Where to start? First of all it was so very nice of MMD to send you seeds from her valuable ruellia. I hope they do well for you. I have that red yucca and love it. I am afraid I may have to move it due to a pipe coming thru my road soon:( That and many other plants including prickly pears and Adam's Needle. Won't be fun. My red yucca bloomed only once in the five years I've had it but the bloom lasted about 5-7 weeks. I loved it. The regular yucca blooms lasted about 5-7 days. I did winter sow this year on your recommendation and info I found from your blog. I hope they all do well. They are not covered with snow like yours though:) Yup, looks like it will take a while. Monica, I can totally identify with you on getting postings done. :} I am always late anymore. The ruellia looks like such a winner-no watering and lots of blooms. Maybe MMD wil bring more seed to SF to share. 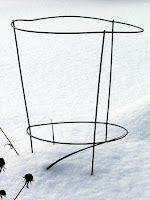 I am goig to have to get your book to learn more about winter sowing. If you can do it in MI, I can surely do it here! I've had good luck with another ruellia here - it's a deep purple one that gets to about 4-5', with purple-y new growth. It's great except for the snails love it. So you might put out some organic bait. They are so pretty though - I love the photo you shared of it! It's interesting to see your winter sowing setup. Are your winter sown seeds in plastic bins or in wooden boxes? Why do you have them up on the wooden supports, for air circulation? Do you water them? I'll be interested to see how they develop. How nice of MMD to share her seeds with you! I remember her showing them on an earlier post. And thanks for showing the Rattlesnake Master--I've seen this on a seed website and wondered about this plant. The name kind of put me off:) I do hope you'll show it in bloom this summer. Beckie and I are going to have to check out your book. I'd love to try my hand at winter seed sowing; I didn't have much luck with my attempts last spring in the basement, so I can't do any worse! Hi Monica, Amazing is the word for your winter sowing. It is too late now to start, but next year for sure it will be done. I need more space inside for those harder to grow things. The hesperaloe sticking out of the snow is heartening, I do hope it survives for you. I ordered some from the same source a couple of years ago and it is still so small, but The Financier gave me a giant plant of it for mother's day and the mailman gave me a seed pod that I planted mid summer and it germinated right away, so we small, medium and large sizes of that plant growing here! That MMD is a doll for sending you seeds too. :-) I can't wait to meet you and see those Lurie gardens. The red yuccas are glorious - well, come spring when you can see them again they will be! Tea - milk last, definately! You need to try Yorkshire Tea if you can get it. I may live in Derbyshire, but I'm a Yorkshire lass through and through! I have to laugh about your interpretation of my seed sharing. Believe it or not, I end up yanking Ruellia seedlings out of the lawn, they are such prolific self-seeders. Most years I deadhead them, but last year a friend expressed interest in the plants, so I figured I might as well let some go to seed & give her the seedlings. Your request was no problem, as there were still some seeds on the plants. I had no clue the plant I've been trying to curb is an endangered species in Michigan. If you don't have enough seed next autumn, I'd be happy to donate some to that Michigan seed bank. I've been so inspired by other garden bloggers this past season that this was an appropriate meme! I love that wild petunia and was lucky to find a small plant at a native plant sale last May. It was very generous of MMD to share some seed with you, Good Luck with your winter sowing. A great job on Shady's Garden Inspiration! I have this wild flower in my southern garden and if you need a southern cousin of it...let me know! Ich habe gesehen, dass Du zum Spring Fling fährst. Wie cool! Like you I love those wild petunias. Good luck with the sowing and I hope you'll have quite a few of them this summer to enjoy.